Visual Marketing is Nearly Here! 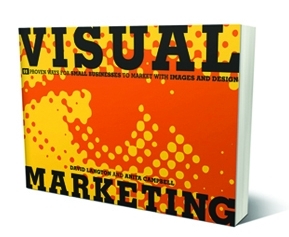 We’re thrilled that our new book, Visual Marketing, is being printed and packed as we speak. It will be on bookshelves September 29. The book is an idea generator. Visual Marketing: 99 Proven Ways for Small Businesses to Market with Images and Design is just what the title says. It contains 99 amazing examples of how small businesses (and a smattering of small non-profits) are using visual images to speak to and connect with customers and the public. It’s what’s known as a “visual thinking” (“VizThink”) book. It helps you solve problems and address business issues, by using images to convey information. We’ve got case studies and examples to get your creative juices flowing, as well as takeaway tips you can apply to your own marketing. The words are sparing. Images and pictures are key to the teachings of this book. Join the authors at the Small Business Influencer Awards, where the authors will the book will advance debut. New York City, Sept 13. Join author Anita Campbell at TouchPoint. Salt Lake City, Sept. 15-16. Visual Marketing is released. Sept. 29. Meet the authors at BlogWorld Expo. Los Angeles, Nov. 3-5. Meet the authors at the New York Business Xpo. New York City, Nov. 16. If you’d like to interview David Langton or Anita Campbell on your publication, radio show or blog, or review the book, please send requests to hello@visualmarketingbook.com.